I put this in the trouble shooting thread but seems no one has either seen this part of my question or cared to answer. Also i thought that any answer may benefit others with similar problems so i thought i would make a thread. If any mod thinks this is spamming i understand but I'm not trying to. Just want to make it more visible and provide help to others through possible answers that can be found. Ok I run a PC with Windows 8.1 64-bit. I have an AMD quad core 3.6Ghz processor, I have 12Gb of ram, and my GPU is a Nvidia Geforce gt 610 1gb vram. The video card is updated to the highest drivers through the control panel of the Nvidia system. 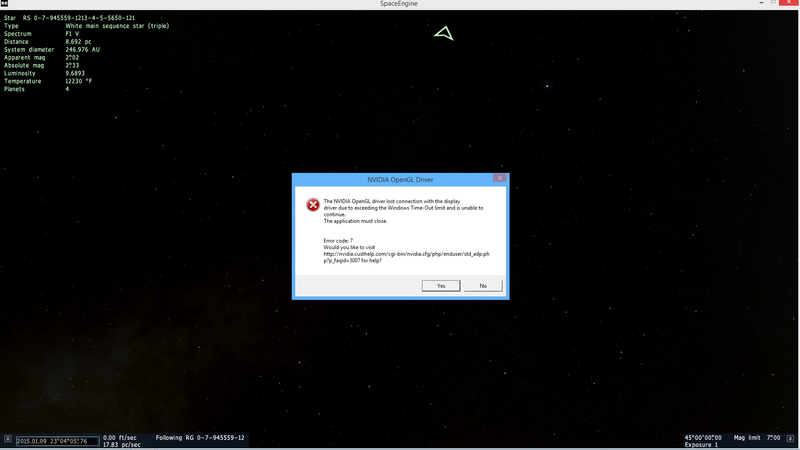 I had very little problems running SE (space engine) 0.9.7.1. The only problems i had with it were some lag times due to the loading of textures. To be expected with a video card like i have. Now when i downloaded 0.9.7.2 it ran pretty much the same at first. After exploring a while i found one of my favorite galaxy types, an Irr galaxy. Of course i wanted to go explore every last little bit of that galaxy. I flew up to it and took some screens (ill post them). I noticed in this version the Irr galaxies are different. They seem to be big versions of the Nebula with stars, black holes, nebula, planets and so on. 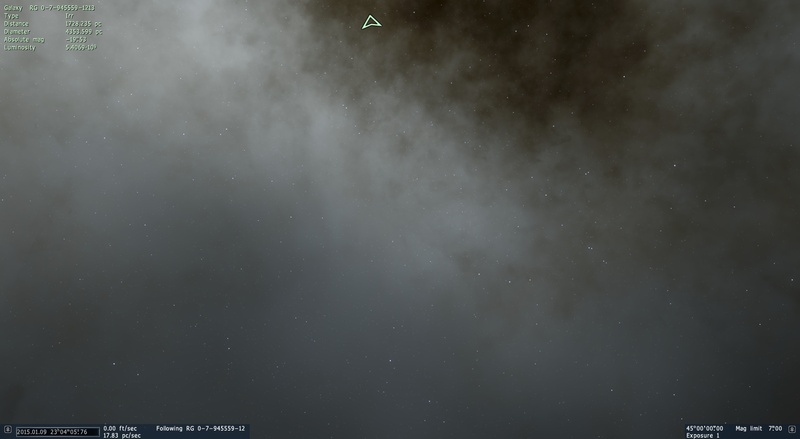 As with most versions of SE my computer lags when i get close to nebula. I think it has problems generating all the particles. As i started to fly further into the Irr galaxy it started lagging like i expected. Then it crashed. It gave me the error 7, a time out error. Apparently, i didn't know about this, after 2 seconds if the GPU hasn't rendered the particles or doesn't respond it times out and crashes the program. Its not exactly a flaw of SE, the time out isn't handled by the program. Its handled by Windows. There are ways to change the time out to more then 2 seconds. My question is and has been, is there a way to fix or get around this problem without having to edit my registry to change the time out length? If no will this have a possible effect on my machine? Can i cause over heating by increasing the time out to 4 seconds? 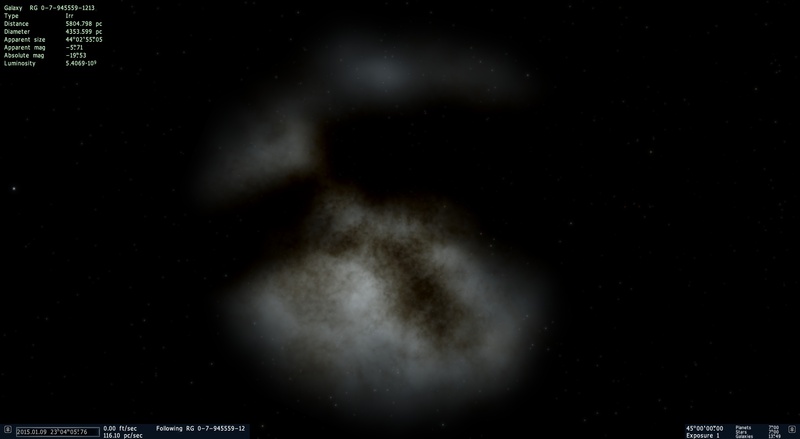 Is there any way to change how the Irr galaxy is rendered through the engine itself? I want to try and find a way to patch, fix, or get around this problem without having to change my registry. I am computer literate, i have taken IT classes and worked on computers since i was little. With that said i am no where near an expert. That's why I'm asking for help here. I will include some screen shots and any other information needed. If there is anything more you need to help me just let me know. Mods if this is in breach of the rules please remove it. Like i stated earlier i thought that answers to this question could benefit others so i made a thread. That and other questions i asked were answered but nothing has even been hinted at this problem. I really love Irr galaxies and want to explore them. Yet in the end if the answer is to simply stay away then i have no choice. But i would like to try somethings first before i just give up. Thanks in advance for any help provided. If any of the screens are to small i will provide the link to the larger pics. Any further information will be provided as required. Also i tried turning the LOD all the way down then flew in as slow as i could handle. With the same end result, the crash. I guess i could try with stars/planets/comet tails or other things off to see if this will help. I just don't think it will. To me it seems to be the massive gas cloud of the galaxy itself that's cause the GPU to time out like that. Rendering all the particles of a nebula is hard enough, but rendering that on a larger scale with many more objects inside is even worse. In the end i may just have to avoid until i can get a better GPU. But please try to help in any way, I have a huge fascination with the Irr galaxies. They are the most beautiful object in the engine to me and i would hate to be tempted and not be able to do anything about it. Was just running SE and I was sitting on a frozen titan. I was messing around with the lens flares and the game just crashed. I'm guessing like you said about the display bug, its a known bug and will be fixed on the next version? Just want to note it in case its not something you knew about and didn't want to make another thread. I don't think it was from the menu, or the changing of lens flares. I think it was from me sitting in one spot on the planet to long. I had the LOD set at 0.